I’ve been getting to grips with my artist block with a stack of Japanese paper. Beautiful and authentic chiyogami that I first discovered in Japan. As usual I sourced my paper from two tried and tested places: Shepherd Falkiners and The Rare Orchid. I always look forward to what they may have in stock next. Who knows? One day soon, perhaps, I’ll be able to pop back over to Tokyo or Kyoto with a huge suitcase. 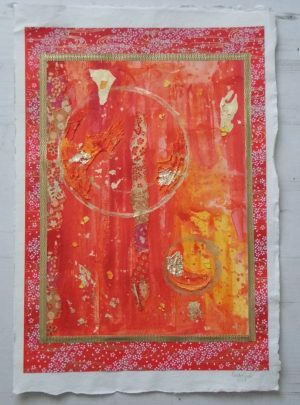 I wrote a little on how I use Japanese paper in my work. Right now, I’m specialising in these medium-sized works. The dimensions of each piece are 38 x 57cm. 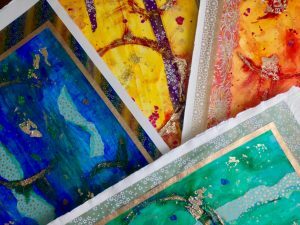 Each one is a colourful abstract which I embellish with gold or silver leaf, egg shell and texture paste. I’ve been doing the outlines of circles because I love what they symbolise: beginnings and endings, completion, wholeness. Sometimes I leave the slight impression of an arc above the actual circle, in a water mark or gold powder paint. 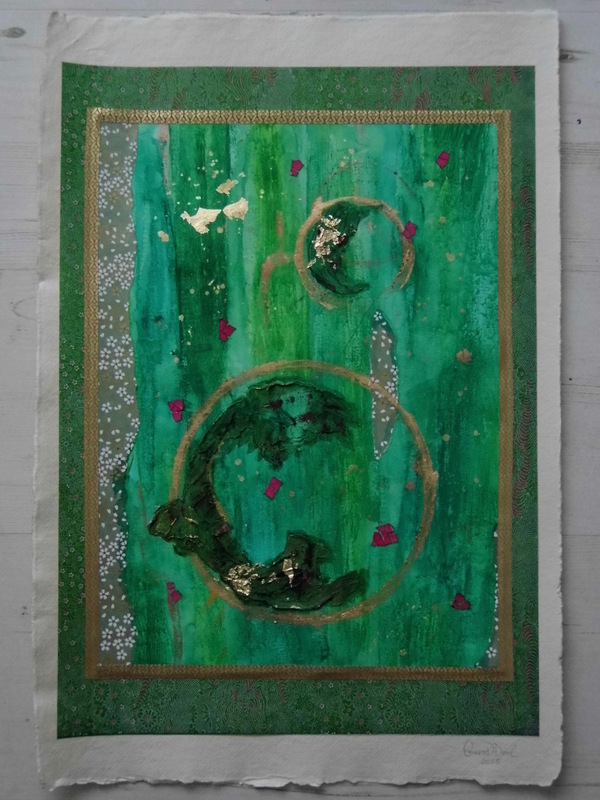 The next stage is to set it onto a frame of chiyogami itself. 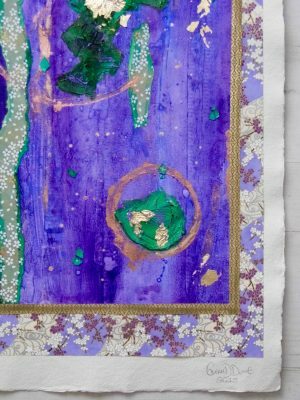 I aim to tie the painting in with the colours of the Japanese paper. In much the same way as I match my earrings or scarf to my frock, for example (or more recently, my Gazelle trainers to my yoga top!). The blue, wheely chiyogami you see above you is from Shepherd Falkiners. And as soon as it was put up online it flew out of the shop! Very kindly, however, they hung on to my order while they awaited a restock of the blue paper. Well worth the wait and I also love the thin, patterned gold border that I edged around the painting. 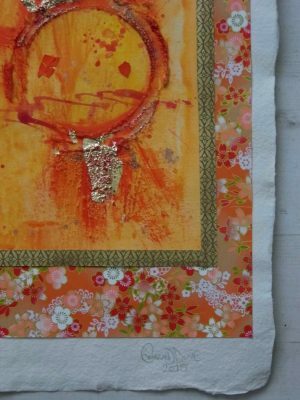 Once I’ve put the abstract together with the frame, I set the whole piece onto a back of thick white paper. The torn edge is a great effect and makes a change from mounting. The end result is a mis-mash of textures and explosion of colour. I’m particularly happy with the combination of materials in these abstracts. And to think this was a buyer’s idea. When she bought an abstract canvas I included some of my handmade cards in her order and a wee thank you. 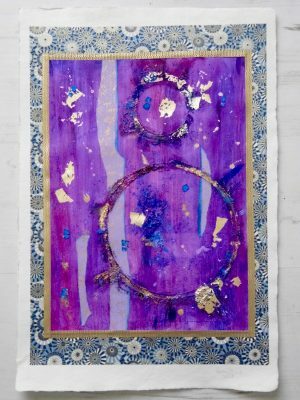 This inspired her to order some bigger works – and the torn paper edge was her suggestion! The next stage will be to have them all bespoke framed. 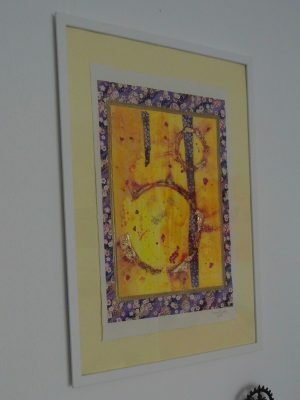 Take a look at how the finished piece can look if you take it to a professional framer. I chose a dark wooden frame to reflect the overall Japanese feel of the piece. 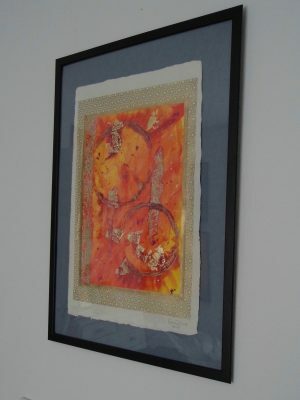 For the time being, however, I photographed my Japanese paper pieces in IKEA frames. It took me some time to get my creative mojo back after my hospital treatment. I had lots of ideas, but I was frequently sleepy and chose to my energy on exercising. So when I finally settled in the studio I wanted to see as much colour as possible. Out of storage came the Japanese paper, waiting patiently in my makeshift storage units (next big project: doing up our back room/studio). Creating these pieces also made me happy as I was able to tick off a task I’d promised myself I’d complete earlier this year. I’m pleased to say I’ve greatly exceeded the agreed amount of four pieces. All these Japanese paper acrylics are available to buy via my Etsy store. Free postage and packaging for buyers in the UK. "La Herradura: A week in Andalusia"
"Almuñécar: The joy of a long walk"